Many people now feel that pending trouble is in the air. They may not know what or why but they can feel it deep in their bones. For these people the urge to prepare for potential problems is now incorporated into their everyday lives. When something far reaching and catastrophic happens the ability of groups and communities to pull together is one way to deal with the aftermath and work through the problems to remain safe and healthy. When something happens that may prevent outside help from reaching you, it is necessary to have the infrastructure and supplies to help yourself until the situation stabilizes. For the group or community there are certain actions that can be taken beforehand to insure the group can sustain themselves for the duration. A potable water supply must be present to sustain the group for as long as necessary. The water source must be available when current systems may be interrupted or destroyed due to the emergency. A water filtering system must be available when necessary to filter any suspect water from potentially contaminated sources. A supply of food must be stocked to insure the group can maintain their health and strength. It is easy enough to store food for individuals or small groups but there must be a system in place to store extra for those that have no supplies for various reasons. If the community can be fed after an event it will greatly decrease the potential for acts of violence and help maintain order. This can be accomplished by storing bulk items for use by large populations. Grain bunkers can be constructed to store bulk grains for this purpose. A minimum of one bushel each of wheat, oats, corn, beans and rice per person per year for the expected population will provide the basics for feeding the affected population following the event. Any food items beyond this would be of additional benefit. A team to assist those in need that may be trapped or injured must be available. This is where the local civil defense unit would be useful following an event. The local CD unit should be able to provide search and rescue, shelter, medical help, food and leadership after an event that may destroy local infrastructure and leadership. A team to provide security for the group must be available to insure the groups safety. The local volunteer militia group, with the necessary training would work with the CD unit to maintain order and security to the population after an event. Some events have the ability to destroy local law enforcement abilities or at the least overwhelm their abilities to maintain order causing even more chaos. Energy systems to provide power for necessary infrastructure to rebuild and repair systems to enhance and support a decent quality of life for the group. Electrical power to provide heat, cooking, lights, communications and water pumping are essential to long term living. Liquid fuels to provide transportation and generating capability will be needed in the days following any event. The ability to provide at least some power from sources such as solar and wind will greatly reduce the need to store large quantities of fuel and lesson the impact of loosing these supplies. Safe shelter is necessary to provide protection from the elements and potential hazardous conditions that may exist as a result of the emergency. In these modern times the threat of an NBC event is as likely as any natural catastrophe. Many of the sheltering needs are similar in these events and any overlap will reduce costs in preparing for these eventualities. The ability of the government to respond to emergencies is limited and requires days before help arrives in many cases. Any large scale event that affects a wide region or the whole nation will overwhelm government resources to the point that many localities may not get the necessary help. In this event it will be up to each locality to provide their own emergency management and solve their problems locally. In most cases emergency management is directed to survival of government operations and civilian populations only receive excess resources from government entities. In some cases such as an act of war, events may eliminate government at some or all levels and necessitate that communities help themselves. 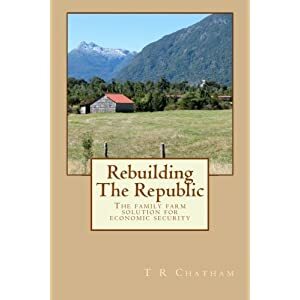 If the community relies solely on government preparations and leadership and suddenly finds that entity gone or even hostile to the people, chaos can grow very quickly destroying any continuity that still remains among the population. Having a civilian group outside of government control to administer to the community today is not only logical but imperative given the nature of events that continue to unfold. Of all the preparations that should be addressed by local communities, the need to have bulk food supplies available is the most pressing. Storing several hundred bushels of grain may seem too much for the average citizen but it is not beyond the abilities of many farmers. In the event of any supply disruptions, locally available food supplies will determine whether the community can maintain continuity for the duration. As it stands now, most large cities will collapse and most small towns will follow during any supply disruption. The government no longer stores sufficient grain to supply the civilian population in the face of any catastrophic event. It is therefore up to each community to take the necessary steps today to insure survivability if the worst should happen. When the grid power that you depend on suddenly stops for an extended time, you need an alternative supply to work with. If you have an off grid home you will have the same options to look at for power. The main thing is if you are living off grid for extended periods you will need to analyze how you create and utilize that power. Using a backup generator for a few days every year is a far cry from providing all of your power on a continuous basis. A backup generator is great but most of them are not built to provide power on a continuous basis. Even if you had the fuel supply to run it for a year it is likely your generator will break down after only a few hundred hours if you are even that lucky. I have seen a brand new generator suffer an electrical failure after the first hour of operation with no load on it. The motor had to have an electrical component replaced inside the motor which required a mechanic with the proper tools and the replacement part. For those that want or need to live off the grid it is necessary to look at the power system and understand where the weak links are. If you find yourself in a situation where you must provide all of the maintenance and repairs yourself, you must have the necessary tools and repair parts as well as the knowledge to do the job. In a longterm situation, the simpler the system is the more reliable it will be and the less you will need to fix over time. There are systems that are well made if you can afford them, and they will give many years of service but eventually you will run into the same problem. You may be called on to repair them some day and most people are not prepared to do that. If you are contemplating a retreat to shelter you from some kind of catastrophic event, you will want something that the average person can work on and maintain with minimal effort for thousands of hours. It is common to find that the most efficient and easy to use systems are filled with high tech components that the average person does not understand and has no hope of fixing given a component breakdown. The more electrical components you have in your power chain from the generator to the appliance you wish to run, the more chance you have for a failure of some type that requires replacement of a component or equipment to restore electrical power. Living off grid you have three basic choices for electrical power. You can have no electrical power, use 110v AC or 12v DC. In many cases you will have a combination of AC and DC components. To keep things simple you may want to analyze your situation and determine if using only 12v DC power may be best longterm. Utilizing only 12v systems will greatly simplify your system and make it easier for the average person to fix when something breaks. A pure 12v system works well with alternative power generation such as solar, wind and hydro. In most cases you are generating power and storing it in a battery bank for later use. If your appliance is 12v DC you will be able to run this item straight off the battery system . In this instance you have reduced your components to the very minimum. Generator, regulator, battery and appliance. This is basically how the electrical system on a car is set up. This very basic electrical system is easy to maintain, very durable and easy to repair. An automotive alternator can operate for thousands of hours and can be rebuilt with a few tools and repair parts by anyone with some mechanical ability. The automotive regulator either internal or external is easy to replace and easy to stock extras for future use. There are many 12v DC appliances available that can be useful in an off grid household to include refrigerators and freezers. When thinking of longterm use the fewer appliances you have the easier it will be to provide the power you need. Having only a few necessary appliances and some 12v lighting will allow you to harden your system and get the most out of it over time. With a 12v system you can still utilize 110v appliances when needed utilizing power inverters but in the event these components become inoperative you will still have the use of your 12v system for full utilization. You may still need a motor to turn your alternator but you will have more options to do so. You can use a small air cool motor that you already have and if it breaks you have the ability to replace it with another one. You can even use your car to provide the power and use it to charge a battery pack. The ability to power engines with homemade fuel also allows you to generate power when fuel is hard to find. Making automotive alternators the center of your power system will give you much more flexibility over time. It is much easier to find another alternator than an AC generator especially in desperate times when everyone is looking for them. The same can be said for power inverters. We have an AC generator for emergency use but to date it has not been used. In the past when we have suffered power outages lasting for days we have used a home built system. We take the motor off of our rotor tiller and bolt it to a board with an automotive alternator. This system charges a set of deep cycle batteries. We then hook a power inverter to the battery pack to run the freezer. With this type of system we can run the motor only a few hours a day and have uninterrupted power all day and night. This helps to conserve limited fuel supplies and limit’s the wear and tear on the motor. When the power goes out we take everything out of the kitchen freezer and put it in the deep freezer. We then place gallon jugs in the deep freezer to freeze and rotate these into the refrigerator to keep it cool. This allows us to keep everything refrigerated and only have to power one appliance to conserve on power. Having some type of plan to maintain power to essential devices is essential to maintaining your quality of life when you can no longer depend on the power grid. Whether you use 12v exclusively or a combination of AC and DC power, you will need to have something you can depend on if the unthinkable happens and you are thrown back on your own resources.